Do you have a special graduate this year? After one of the biggest events of their life, it can be scary for them heading out in the real world. With family and friends standing behind them, they are sure to succeed! Here are 11 DIY Graduation gifts that will make you a superstar in their eyes! 1. College is a whole new world and this will be the perfect Freshman Kit to get them going in the right direction. 2. This money card will be a hit! 3. This frame is perfect to hang in any dorm room…you never know when you will have an emergency! 4. What graduate will not love their favorite candy bar and some cold hard cash? 5. This emergency kit is one the new Freshman shouldn’t live without! 6. Load the grad up on their favorite junk food! 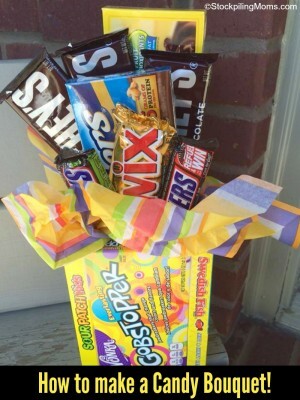 These candy bouquets are so fun! 7. A t-shirt quilt is perfect for remembering all of the fun memories! 8. This framed quote would be a perfect addition to any bedroom! 9. 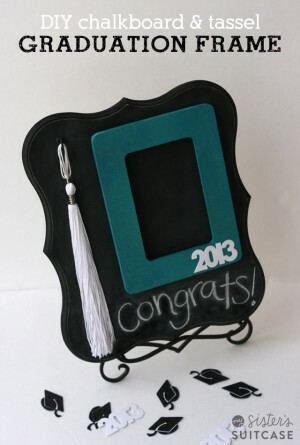 This chalkboard frame is perfect for their graduation picture. 10. Give them a set of bottles that they will just love! 11. Love this Laundry Bag! So cute and so practical! Hopefully you found the perfect gift idea for your graduate! « This Is The Perfect Way To Make Penguin Pancakes! Really nice post!I would like to suggest you to add more options like graduation shirts designs and graduation hoodies designs. Most of the seniors really love them and wear them during the sen18or year. Interested in making the freshman year survival kit. Wondering if you can tell me what you put in this one. Please post what items you put in the Freshman Survival Kit. I would to know what items you put in survival kit as well. Thank You! I lined my mini sewing kit with a $20 bill. In the lining I put a credit card that each month I added money to and a list of friends and family she could call. My most personal item was a book with letters I’ve written on different pages. Like when your frustrated or when your unsure.